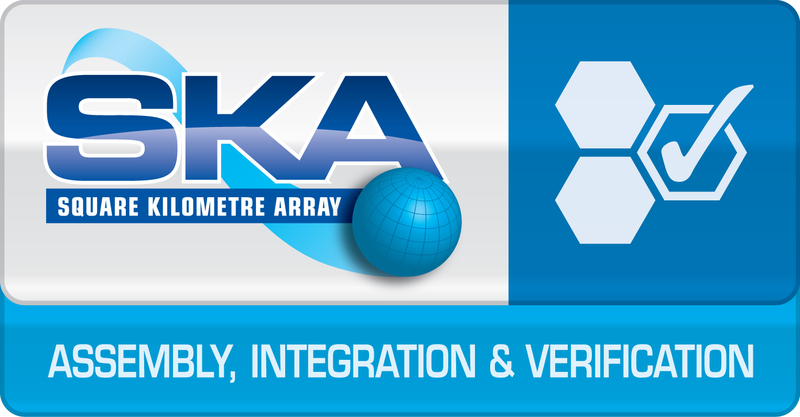 The Assembly, Integration and Verification (AIV) work package represents one of eleven key elements that will make up the SKA1 Telescope. Whereas the other ten elements are tasked with designing key components of the SKA1 Telescope, the AIV element is tasked to perform all necessary planning to integrate these key components into a telescope system that meets the engineering (Level-1) requirements. The SKA1 Telescope will consist of SKA1-mid, which will be located in South Africa, and SKA1-low, which will be located in Australia. SKA1-mid will consist of approximately 133 SKA-mid Dishes, plus a further 64 MeerKAT Precursor Dishes. The AIV work package therefore includes the planning for integrating the MeerKAT Precursor into the SKA1-mid Telescope. SKA1-low will consist of 512 SKA1-low Stations, which will include a total of approximately 125,000 individual low-frequency antennas. 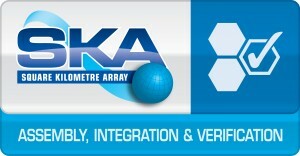 The member organisations of the AIV Consortium are SKA SA, CSIRO and ASTRON, with SKA SA leading the consortium. All three member organisations have significant experience in building radio telescopes, and therefore have a vast amount of integration and verification know-how that is benefitting the AIV work package. The AIV work package during the Pre-Construction Phase is essentially about planning and the identification of constraints and interfaces. Verification Planning is based on the V-Diagram, shown in Figure 1. 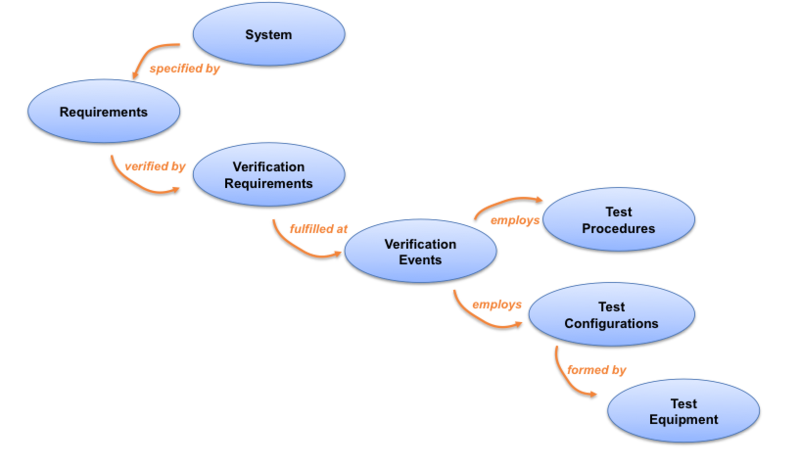 Following a classical systems engineering approach, the top-down design of a system is followed by bottom-up verification. 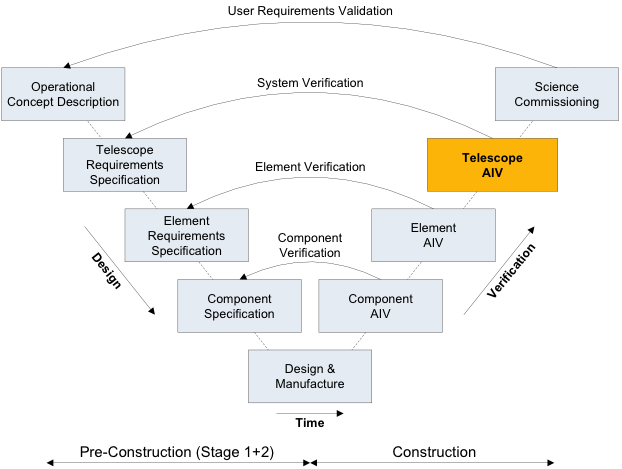 This implies that Telescope System Verification activities are preceded by Element Verification activities, and followed by the final validation of the user and science requirements. 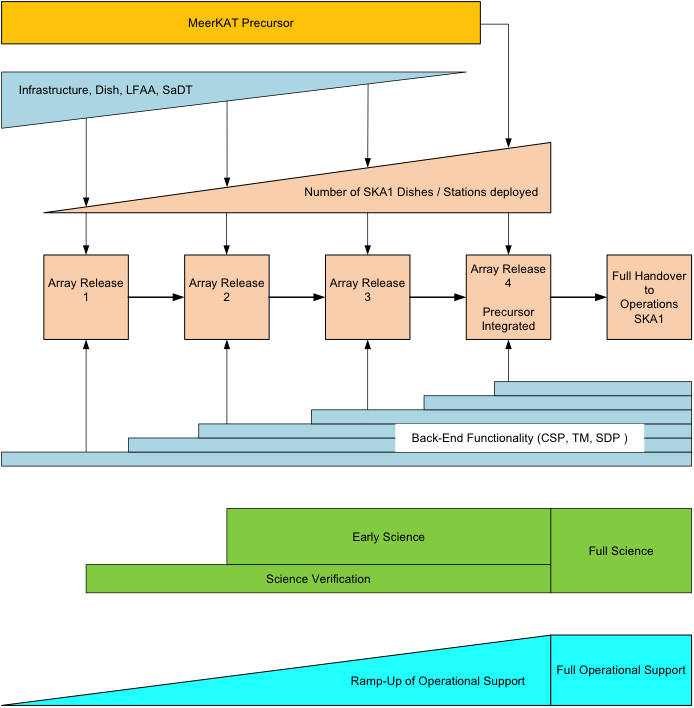 The Telescope System Verification activities are derived by developing the Verification Model shown in Figure 2. Starting with the Level-1 Requirements, which specify the Telescope System, Verification Requirements are developed, which outline how the Level-1 Requirements will be verified. Verification Events are identified, as well as Test Procedures, Test Configurations and Test Equipment. Another important aspect of Verification Planning is the development of a Telescope Roll-Out Plan, which needs to consider the sequencing of implemented functionality, based on a prioritisation of requirements and risk mitigation. A staged roll-out process includes Array Releases, where each Array Release is defined by a defined set of functionality. The Roll-Out Plan therefore provides guidance to other SKA1 elements regarding the functionality of delivered SKA1 products on site, at a specified time. Figure 3 illustrates some of the concepts that are introduced in the Roll-Out Plan. Once the roll-out plan has been established, the AIV Consortium is able to develop an Integration & Verification Plan for both SKA1-mid and SKA1-low. The Integration & Verification Plan provides a structured framework, in which all integration and verification activities will be carried out in a coordinated manner during the Construction Phase. It will consider early mitigation of high-risk issues and traceability to Level-1 Requirements. 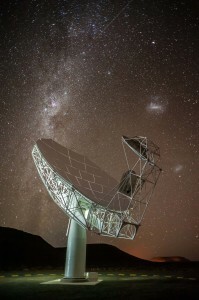 The integration of the MeerKAT Precursor into SKA1-mid is currently planned towards the end of the Construction Phase, after MeerKAT has been operational for a number of years. The AIV Consortium is developing the Interface Control Documents (ICDs) between the MeerKAT Precursor and other SKA1 Elements. It is also planning the development of the required integration components, which are essentially Local Monitoring & Control (LMC) software packages. During the recent Preliminary Design Review (PDR) of the AIV Consortium, the PDR review panel advised the SKA Office to further review options for retrofits of the Precursor’s hardware, e.g. replacing MeerKAT L-Band Feeds with SKA1-mid Band 2 Feeds, among other possibilities. The AIV Consortium is currently drafting an Engineering Change Proposal (ECP) to retrofit the MeerKAT Receivers (called “Digitisers” within the MeerKAT project) with SKA1-mid Receivers. The issue of retrofitting Feeds depends on a system-level investigation of the final frequency ranges for Band 1 and Band 2, and will not be part of this ECP. The assembly, integration and verification stage of any system is often the stage where issues of upstream neglect become visible. These issues can cause major integration challenges. Unfortunately, any problems encountered during the “upstream” stage are very difficult to rectify “downstream” during assembly and integration. It is therefore critical that the science requirements are accurately translated to Element-level requirements during the design stage. It is equally important that the interfaces between the different products, and the interfaces with the MeerKAT Precursor, are accurately defined early in the project. Another major challenge is that the software/firmware dominated Elements (CSP, SDP and TM) need to deliver systems with basic functionality very soon after tenders have been awarded. Experience with other radio telescopes has consistently shown that the roll-out activities and AIV work scope is often under-estimated, even at component level, and often causes delays in deployment, due to re-engineering and retrofitting of components. This may significantly increase the total cost of the system. Schedule and cost risks are continuously being recorded and highlighted, so that mitigation plans can be developed. The AIV Consortium has successfully closed-out its PDR, and is now fully engaged with its Stage 2 Milestones. Immediately on the horizon are a review of its internal Project Management Plan (PMP) and Systems Engineering Management Plan (SEMP), whilst progress on the Integration & Verification Plan is continuing in parallel. The consortium is also ramping up its resources, with an additional person having recently joined the team within ASTRON, and another full-time person currently being appointed at CSIRO.